Modular changes how distributors order and stock ladder racks. 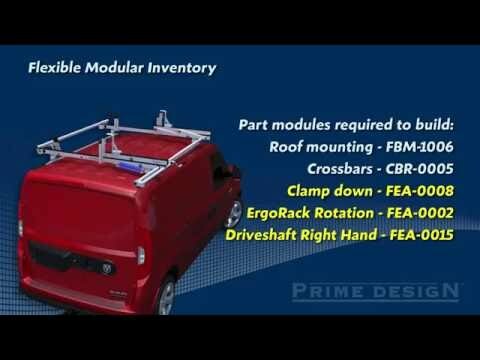 The Modular ErgoRack product family contains 30 SKUs that support multiple vehicle and rack configurations, and is designed to help a Distributor offer more options while inventorying fewer SKUs. Many of our distributors were looking for a more cost effective way to inventory. We realized we could create a set of part IDs that could help distributors inventory fewer SKUs while being able to service more customers at the same time. All of these items will be helpful in training new employees and customers. New modular labels are color coded. Now, installers can ensure they have everything they need before opening a single box. This also simplifies inventory control. Modular boxes are lighter and easier to handle than a full rack box. For example, a modular box weighs 30 lbs., while a full rack box weighs 130 lbs. From 30 SKUs offer over 150 rack combinations for 11 van models. Offer Base, Clamp down, or Rotation features (FEA) from the same inventory. Have the right product in stock at the right time. Customers can easily upgrade their rack features (FEA) from Base models to Clamp-Down to Rotation when the budget allows or the need arises.